Are you ready for some football!? True, this year’s biggest day in football is a bit of a disappointment to Baltimore (and Washington) fans with neither local team making the playoff cut for 2013. But shake off that sadness and get ready to party! This is your last chance to watch football until August! End the season with a bangin’ party with delicious finger foods, tasty beverages, and all your best friends. 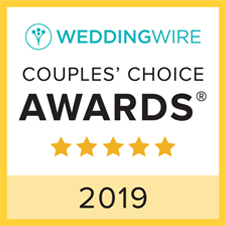 It’s not too late to plan a party for this weekend! All you’ll need are some fun recipes. 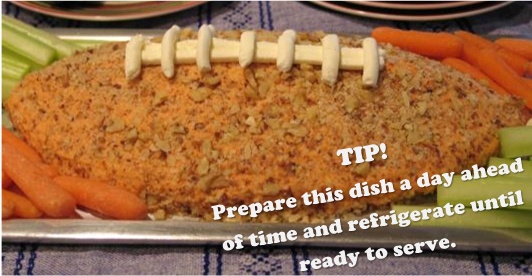 Did you know you can make cheese dip in the shape of a football? Just click the image below for the delicious recipe! 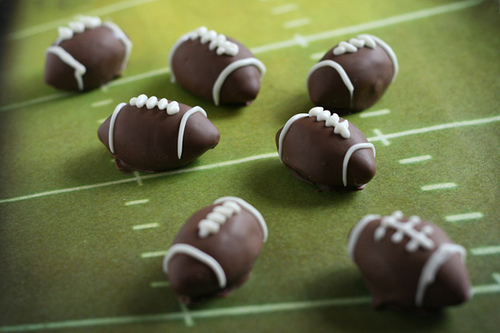 For your friends’ sweet tooth be sure to include these adorable Football Shaped Oreo Truffles from Bakerella! There’s nothing more annoying than being fashionably late to a party only to find there are no seats left. Or having to call “fives” or “dibs” every time you get up just so you won’t lose a prime spot in front of the big screen. That’s where Party Plus’ inventory of affordable chairs comes in. Don’t be the host that forgets to provide adequate seating to your guests! Even if they are your best friends- they’ll judge you. Just kidding- they probably won’t judge you- but they’ll be mildly annoyed and who wants that? We have folding chairs and plenty with cushions to keep your guests comfy and happy as they watch the big game and nosh on your game day menu.